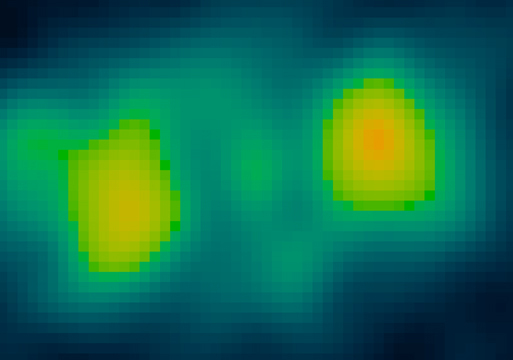 The most recent Chandra image of SS 433 shows two high speed lobes of 50 million degree gas 5 trillion kilometers apart on opposite sides of a binary black hole system. 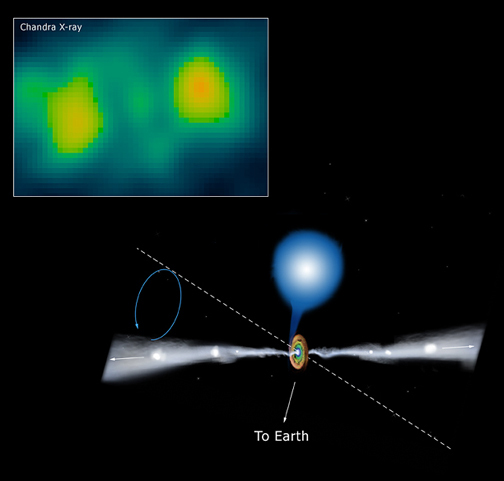 As shown in the illustration (lower right), the binary system, which has a diameter several million times smaller than the distance between the lobes, consists of a massive star and a black hole with a disk of hot matter. Material is ejected from this disk in narrow jets that slowly wobble or precess around a circle (represented by blue circular arrow), from the sketched location of the jet at one extreme to the dotted white line at another. The detection of the hot gas lobes so far away from the central black hole came as a surprise since earlier observations by Chandra and the Hubble Space Telescope had indicated that gas was cooling as it expanded away from the vicinity of the black hole in narrow jets. This led scientists to predict that no hot gas would be found further than a few million kilometers from the black hole. This observation implies that the gas in the jets has been reheated, most likely by collisions between blobs of gas. Long-term optical monitoring observations have shown that matter is ejected every few minutes from the vicinity of the black hole in bullet-like gaseous blobs. The blobs apparently travel outward at about a quarter of the speed of light for several months without colliding until a faster blob rear-ends a slower one, precipitating a pileup that reheats the gas. SS 433 is similar to the XTE J1550-564 binary system, in that they both involve black holes that are producing high speed jets of gas. However, there are significant differences. The X-ray emitting lobes in XTE J1550 are observed to be much further from the black hole than those in SS 433, and the X-rays from the XTE J1550 lobes appear to be produced by a magnetized cloud of highly energetic electrons, not clouds of hot gas as in SS 433. These differences might be due to the mass of the companion stars, which are quite dissimilar. In XTE J1550, the companion star has a mass similar to that of the Sun, whereas in SS 433, the companion star's mass is estimated to be almost 20 times that of the Sun. Perhaps the rapid rate of evaporation of matter from the massive star could affect the behavior of the jets in SS 433. Scale Image is 6.5 arcsec on a side. Coordinates (J2000) RA 19h 11m 49.5s | Dec +04° 58´ 58"